PHOENIX, Ariz. — The national law firm of Quarles & Brady LLP today announced that Phoenix office managing partner Nicole Stanton was honored by the Southwest Center for HIV/AIDS with its 2016 Outstanding Achievement Award during the organization’s 21st Annual Night for Life Gala, which took place on Saturday, May 14 at the JW Marriott Camelback Inn Resort and Spa in Scottsdale, Ariz. In addition to her position as office manager partner at Quarles & Brady and as a member of the firm’s Commercial Litigation Group, Stanton is the founder of The Dion Initiative for Child Well-Being and Bullying Prevention at Arizona State University, which is committed to promoting environments that foster children's health, well-being, and academic success. To accomplish this, The Dion Initiative brings together renowned educators, dedicated direct service providers, and private-sector innovators to create a greater understanding of the obstacles our children face and to develop and share evidenced-based and easily replicable programs that overcome those obstacles. Recently elected to the American Law Institute as a member and the Arizona Equal Justice Foundation board of directors, Stanton serves the local Phoenix community as a founding board member and past president of the Women’s Metropolitan Arts Council of the Phoenix Art Museum as well as a member of Charter 100 Women. 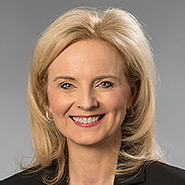 She also is an adjunct professor at Arizona State University Sandra Day O’Connor College of Law teaching professional responsibility, and served as a member of the Business Court Advisory Committee. A graduate of Valley Leadership Class XXIX, Stanton is a recent recipient of the Gay, Lesbian and Straight Education Network (GLSEN) Phoenix Ally Award, which is given annually to local leaders who advocate for safe and respectful schools and create positive change for all students, including lesbian, gay, bisexual, transgender, and questioning youth, and was named as the 2015 “Philanthropic Leader of the Year” at the 8th Annual Positively Powerful Woman Awards. She is a past YWCA of Maricopa County’s Tribute to Women honoree in the Business Leader category. Stanton has also been honored as one of the “Most Admired Leaders in Arizona” by the Phoenix Business Journal and “50 Most Influential Women in Business” by AZ Business Magazine. Southwest Center for HIV/AIDS is the only organization in the Southwestern United States to combine prevention and education programs, health and wellness services, as well as research and clinical trials in a single location and reaches more than 30,000 at-risk individuals each year. Southwest Center has helped to bring 32 of the 34 available HIV/AIDS medications to market, contributing to worldwide research. The mission of southwest Center for HIV/AIDS is to prevent and reduce infection, improve the quality of life for those impacted by HIV/AIDS, and contribute to worldwide research. Our vision is to lead the fight against HIV and AIDS.